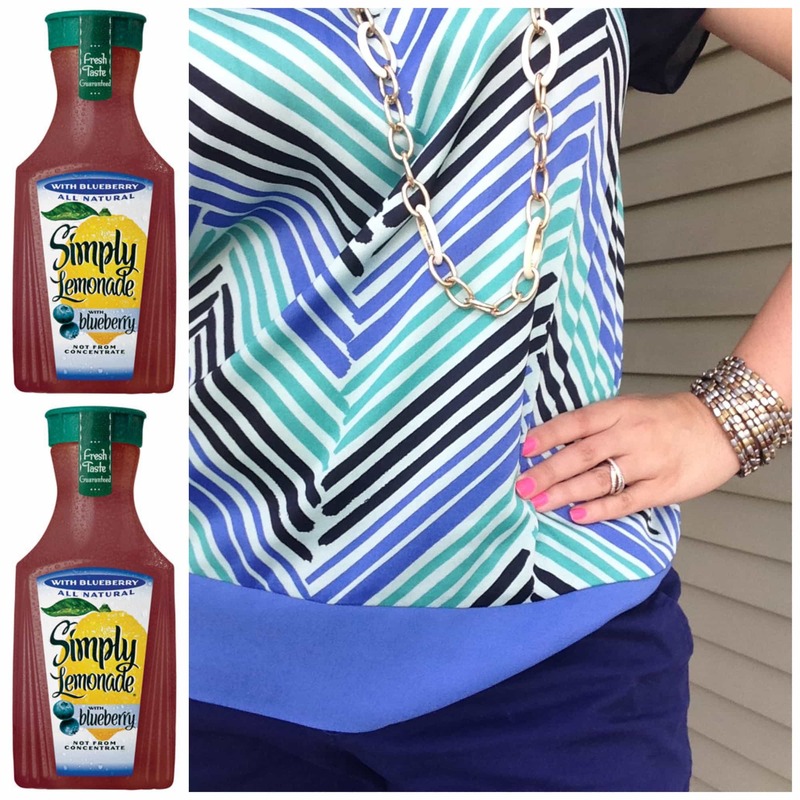 Lady and the Blog → Living → Product Reviews → For Mom → A Drink And An Outfit With A Twist #SimplyBlend : PLUS Enter To Win $100 Gift Card!! A Drink And An Outfit With A Twist #SimplyBlend : PLUS Enter To Win $100 Gift Card!! I’m warning you – this post is going to make you thirsty and put you in the mood to shop all at the same time! HUGE fan of Simply Orange and Simply Lemonade – so I was super excited when they asked me to come up with a post with a twist. 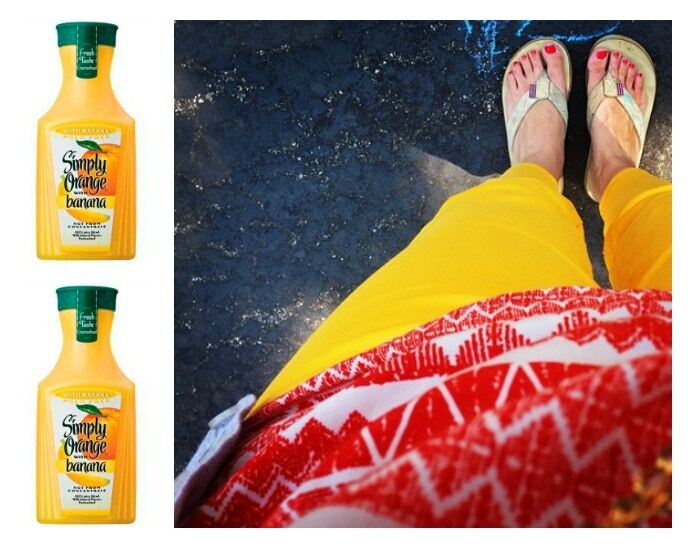 § Simply Orange® with Banana – the perfect juice blend for a day at the beach. The banana flavor isn’t overpowering but it’s definitely a nice twist to an old classic. I even love the change in texture that the mixture creates. § Simply Orange® with Tangerine – to switch up your regular breakfast routine. This one packs a sweeter punch than your usual glass of OJ. I am a huge tangerine fan and certainly love this new flavor. § Simply Lemonade® with Blueberry – a delightful summer refresher. If you like sweet you will LOVE this lemonade. My kids go CRAZY when I blend it with some ice. Want to have a little fun? Top your drink with some fresh blueberries!! I drink lemonade every single day of my life – so I thought it would be fun to try something different in the drink department and BOY am I glad I did – so refreshing and full of flavor. Using the new flavors (and colors) as inspiration, I thought to change up the outfit I wore last week while attending a brunch in NYC. Yellow ankle skinnies just scream summer, don’t they? I picked up this pair from TJMaxx – so sadly I can’t provide a link for purchase. So, here’s another version from Rag & Bone. The top is also from TJMaxx – so I provided a similar style from Lucky. The flip flops are from Vineyard Vines. This certainly brightens up my previous look right?? For blueberry – I went all blue. Head to toe! Thought that would be fun. The Ann Taylor shirt I am wearing is from last season. The pants are boyfriend skinny khakis from Old Navy. The bracelet is the metallic mix bracelet from iSanctuary and the necklace is from CWonder outlets. Last but not least, we have Simply Orange with Tangerine. I didn’t have anything in the tangerine department… so I decided to create an inspirational outfit for you to check out. The tangerine dress is from Intermix. The Demi Wedges are from Tory Burch. Link necklace is from Trina Turk and the bangles are from Mark Girl. LOVE THIS LOOK! Lots of fun bright colors. So, which look is your favorite? Which would you see yourself wearing? Want more information about the new flavors? Like Simply Orange Juice on Facebook! 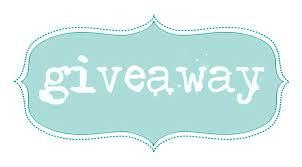 One (1) lucky Lady and the Blog reader will receive a $100 American Express gift card and coupons for our new blends!! 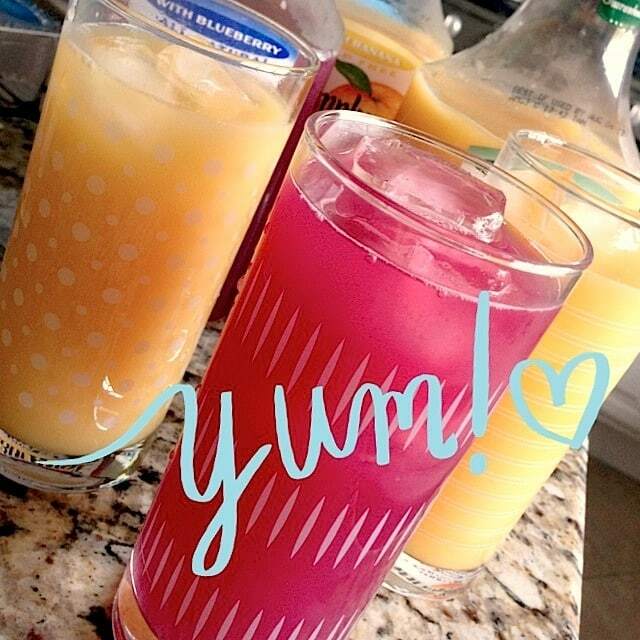 We love Simply Lemonade! You are right, your post made me thirsty! Can’t wait to try the blends. how about mango and berries? I love orange and banana – could be awesome with a bit of chocolate added in! Lemonade and White Peach tea is amazing!!!! I think just about anything blended with lemonade sounds great! The blueberry does sound good. Can’t wait to try it. Strawberries and bananas. I think I’d like strawberry best and this sounds delish. I’m going to buy some today when I do my shopping thanks to your post. I think the combination of lemonade and blueberries sounds delish! I like blueberry blended with greek yogurt. I’d like to see pineapple and banana combined. I love anything strawberry and banana!! I Love All Sorts Of Blended Things, Fashion, Foods, Art, My Favorite Flavor Is Simply Lemonade With Blueberry! Id love to see the tangerine mixed with the banana! I think the banana would be my favorite! i would love my two fav flavor/scent to be blended apricot and vanilla. but i think as a fruit drink that wouldnt be so great. so apricot and raspberry would taste better. Can’t wait to try simply orange with banana!! I would like strawberries and bananas blended together and I think the simply orange with banana would be my favorite. I would like strawberries and bananas. I love pink and orange together, so strawberries and oranges would make a nice drink. Thanks for the chance to win! I would like Simply Orange with Banana. strawberries and kiwi would be nice. I would love to try lemonade with blueberry – and that’s my fave outfit too! I would do strawberries and bananas, yum! I’d like to try the blueberry one. Blueberry and tangerine or blueberry and strawberry! Apricot and mango is a nice combination. I think I would like the Simply Orange with Banana the most. I would like to see Pineapple and Mango blended together. I think I would enjoy Simply Lemonade with Blueberry. I would like Orange and Pineapple blended together. I would like the Simply Orange and Banana the most. I love Pineapples and Bananas. I would love to see Orange and Guava! I’d love grapefruit blended with something like orange or tangerine. Love citrus that isn’t too sweet. The orange/tangerine sounds lovely. Kiwi Lemonade would be yummy! I would like the blueberry and lemonade. I think I would also like grapefruit juice and cherry. I would love to blend banana, mango and orange juice! I think raspberry acai would be a great combo, but of the flavors here I’d love to try the Simple Lemonade with Blueberry. No Rafflecoper form,please enter me. How about lychee and cherry? Apples and blueberries would be good to me! I would blend kiwi and raspberry. I would like to try pineapple and maybe blueberry. Not sure why but that sounds delicious right now. I would really like to try something with pineapple and watermelon mixed together. Thank y ou! I’d like to see strawberry and mango mixed together. I’d love lemonade and blueberries. Blueberries are one of my favorite fruits. It’d have to be the large over-ripe sweet ones though to balance out the flavor well. I think lemonade is nice with strawberry, so that would be cool…unless that’s a thing already. LOL I can’t keep up. I think grape mangosteen juice combination might be interesting. I think the strawberry & banana I would like to blend & would like to try the banana the most. I’d like to try the orange with banana. Lemonade with Blueberry sounds the best to me! I’d love to see mango with lemon as well. I would like the Simply Orange® with Banana I believe. Sounds delicious. I would like to see Mango & Lime! I like butter and garlic mixed together. Mango and peach or mango and pineapple. I would like lemon aid and peach. cherry and lemonade, or maybe orange and coconut. I think I would like the orange and banana, and it would be neat to see a strawberry and banana. I think I’d like the orange/tangerine best and I’d like to see orange & pineapple blended. Mango and peach or tangerine and coconut. The tangerine dress is from Intermix and the bangles from Mark Girl. I would like Simply Orange with Banana the best. I would like to see Raspberry and banana mixed together !! I like pineapple and banana! Strawberry and banana sounds good to me! I would like to see Banana and Ginger blended together! I think I’d enjoy the Blueberry Lemonade the most. Would like to see pomegranate and blueberry blended together! But out of these products, the blueberry lemonade sounds amazing! I love orange peach as a combo! Blueberry lemonade sounds great, though! Tangerine sounds amazing out of these choices! I would like to see blood orange mixed with lemonade. I would like to see Pineapple blended with strawberry. The Simply Lemonade with blueberry sounds the best to me. Would love to see a blueberry and honey tea! I want mango & pineapple, love them both. Orange and vanilla: creamsicle bliss! Strawberry, red currant, and mango. strawberry & peach are yummy! The blueberry one sounds the best. I love strawberry and banana, which is weird because I hate bananas. Thank you! The Simply Orange with Raspberry. I want to gave coconut milk and banana blended together! I like the combination of mango and pineapple. I’d like to blend lime and acai. I would like to see pineapple and mango blended together. The product I think I’d like most is Simply Orange® with Tangerine. I love strawberry and lemon together. I would love to try the lemonade and blueberry, but I also bet lemonade with cherry or strawberry would be delicious as well! I’m a simple girl so I’m going to go with blueberries and bananas. I’d like to see an unsweetened orange juice blended with tart cherry juice. That would be seriously yummy! I would like the Orange with Tangerine. I would love to try two kinds… strawberry and banana…. and oranges and banana. I’d like to see peach blueberry! I’d like to see blended me and a nice ocean beach resort 🙂 But since that is not going to happen any time soon than I would console myself with the blueberry lemonade. strawberry and banana sound good. I love chocolate and strawberries! when is someone going to mix me one of those! I would like apples and pears blended. Guava and strawberry would be delish!! I’d like to see the Lemonade blended with Pomegranate. I think I would like the Lemonade with Blueberry the best. Tangerine. Would do a cocanut pineapple too. Orange pineapple is one of my favorites. I’d love to see mint & lemonade blended together. Anything blueberry though sounds amazing! I like the combination of pineapple, orange, and banana. I would like chocolate and any berry. I would like Pineapple and Tangerine. I would like to try the Lemonade with blueberry. Lemonade Blueberry – I love blueberries! Anything with blueberries, like blueberry-pomegranate. Yum. I think watermelon and pineapple would be yummy! I’d like to see a strawberry-watermelon blend. I would like to see apple and grape blended together. These are two of my favorite juices. Orange, pineapple, and strawberry sounds like it might make an okay combination. I’d like to see white grape and pear combined. Thanks for the chance. Coconut and pineapple my favs! I love to see new and old components together, like rustic wood and stainless steel! I would like strawberry, banana, pineapple, and kiwi. Raspberry/pear….that would be a tasty blend. 🙂 It would smell good too! Thank you. Strawberry and banana is my favorite! Strawberry Banana is always good! I love mango and pineapple! I think Id enjoy orange, pineapple and bananna. Strawberry, Pinneapple and banana sound like a great combination. I want to try the Simply Banana blended with strawberries and bananas. Passion fruit, Orange, & Guava is my favorite combination! POG! 🙂 I can only find it in Hawaii, so I’d love it if someone on the mainland would bottle that up for me!!! i like to see fruits and greens blended together. i think i’d like the blueberry lemonade the best. I would like to see pineapple and strawberries mixed together! I like mixing lemonade with cherry or pomegranate. Anything with lemonade is great. Strawberry and banana would be a blend I’d love. I would like to try Lemonade with blueberry. The orange and banana flavor sounds great. I would love a strawberry lemonade flavor too! I would like a blackberry banana blend. I would love to try there Simply Orange with Banana. Peanut butter and chocolate, Dark chocolate that is, yummy. I would like peach and blackberry blend. Lemonade and Ginger would be nice and different. 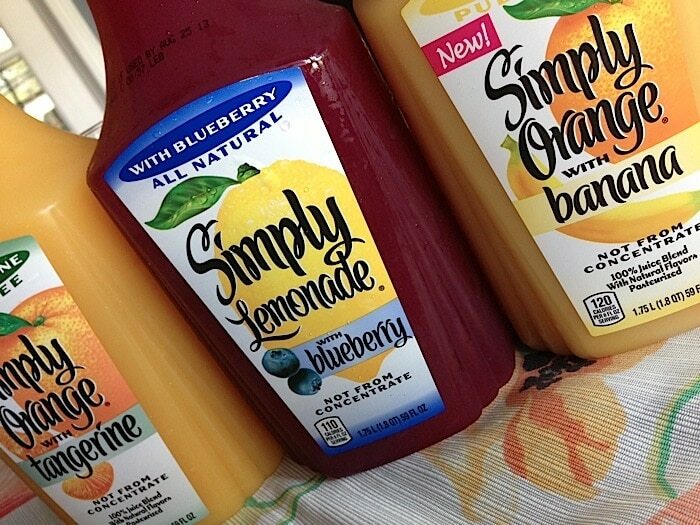 I would love the Simply Lemonade® with Blueberry. I’ve always liked strawberry and banana. Tangerine lemonade would be awesome! Coconut and Pineapple sounds great to drink and to soothe and blend for my body. Lately I have really liked Peach Tea and Lemonade mixed together. Orange pineapple would be fantastic! I think I’d like the Lemonade and blueberry the best, and I’d love to see mango and banana mixed together! Orange, tangerine & grapefruit is a blend I would love to see. I think I’d like the Simply Lemonade w/blueberry best. I would like to see chocolate and strawberries blended. Siimply Orange with Banana is my favorite. I would like to mix lime and mango. I’d love to see mango pineapple! I think the lemonade with blueberry would be delicious! I would like raspberries and blueberries blended together. Oops, forgot to put my email also would love to try the Blueberry. I think a kiwi-blackberry juice blend would be amazing! I would love strawberry kiwi! I would like to see kiwi, strawberry, and blueberry. I love peach and mango mixed together! Thank you so much for this chance! I would love strawberry kiwi or strawberry banana. Strawberry and banana sounds good to me. Thanks! Peaches and white grape juice. Or tangerines and white grape juice. Both sound great to me. I would love to see pear and blueberry blended together. I love Simply Lemonade. I take your lemonade blueberry idea one step further and add fresh blueberries and protein powder and make myself a delicious and nutritious smoothie! I would love a mix of the Simply Lemonade and Strawberries! I’m thinking pineapple and banana! I’d like to try the Orange and banana though. Strawberry and pineapple would be great. Sour cherry and honey crisp apple juices. I love raspberry and lemon combined! Any combination of those two is perfection! Thanks for the giveaway… Raspberry & Mango ! Strawberry Kiwi would be amazing! Strawberry and lemon sounds good. I’d like strawberry & banana but I’d like to try that Tangerine that pictured. I’d like to see pineapple and kiwi blended. I like the pineapple flavor the best. I would like to see watermelon and kiwi blended together. Mango, strawberries, and coconut would be delicious.